The United States is a constitutional democracy, whether Trump likes it or not. On April 25, as Donald Trump neared the 100th day of his presidency, a federal judge in San Francisco dealt a blow to one of his signature initiatives—an executive order denying federal funding to sanctuary cities. Federal District Judge William Orrick ruled that the order violated states’ rights by seeking to coerce local jurisdictions into doing the federal government’s work for it; it also violated the separation of powers, because only Congress can impose conditions on federal funding. The decision was a ringing victory for immigrants, the Constitution, and the growing resistance to a president who seems equally hostile to foreign nationals and our country’s own founding document. The most important story of the president’s first 100 days is the strength of our system’s response when confronted by a president dismissive of civil rights, civil liberties, and the rule of law. Trump has shown either abject ignorance of or outright disregard for such fundamental constitutional precepts as judicial review, the establishment clause, freedom of the press, and reproductive freedom. Shortly after his election, Trump proposed in a tweet that flag burners should be imprisoned and stripped of their citizenship—thereby advocating two unconstitutional acts in a single 138-character statement. His executive order barring travel from predominantly Muslim countries is a blatant violation of the establishment clause, a fact that Trump himself underscored by explaining, on the Christian Broadcasting Network the day the first travel ban was issued, that it was designed to favor Christian over Muslim refugees. More recently, White House chief of staff Reince Priebus confirmed that the administration is considering amending the First Amendment to restrict freedom of the press and, as Trump suggested during the campaign, “open up” libel laws. The presi­dent seems hostile to our country’s Constitution. But we are a constitutional democracy, whether Trump likes it or not. So he can’t change the libel laws, overturn Roe v. Wade, establish Christianity as the US religion, or use federal-funding conditions to coerce recalcitrant states, unless he can overcome two forms of resistance: the people and the courts. The people’s resistance has shown itself early and often, from the Women’s Marches and the airport demonstrations to the March for Science and the People’s Climate Mobilization. Virtually every weekend, citizens are coming together to voice their concern over a president who appeals to hate and xenophobia. We remain a democracy, at least for the moment, and as long as people are willing to stand up to Trump, his ability to do harm will be contained—as his failure to repeal the Affordable Care Act demonstrated. The courts, too, play a critical role, especially when one party controls both Congress and the presidency. 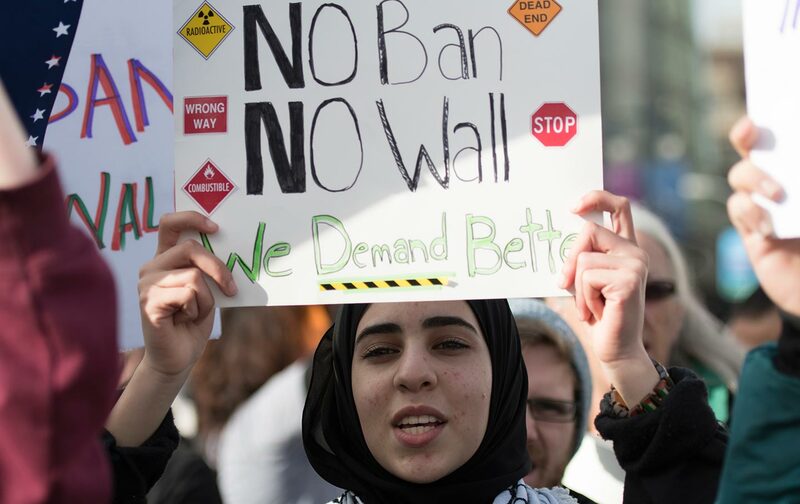 Already, multiple courts have declared Trump’s travel bans unconstitutional, both in their initial unvarnished form and in the revised version scrubbed by his attorneys to better withstand judicial review. On May 8, the US Court of Appeals for the Fourth Circuit will hear arguments in Trump’s appeal of an injunction issued against the revised travel ban, in a case in which I am co-counsel with the ACLU and the National Immigration Law Center. Later in the month, another appellate court in Seattle will hear arguments in a similar appeal. Trump’s approach to the courts is indicative of his broader disregard for the Constitution’s first principles. When a judge in Washington enjoined the first travel ban, Trump dismissed him as a “so-called judge.” When a unanimous panel of the US Court of Appeals affirmed that injunction, Trump tweeted “see you in court,” apparently not understanding that he was already being seen in court by those who had sued him there. His attorney general, Jeff Sessions, who ought to know better, expressed his own astonishment that “a judge sitting on an island in the Pacific” could enjoin the president. It’s called judicial review. The administration’s arguments in court are only slightly less dismissive. In the first travel-ban case, the government argued that Trump’s executive order was “unreviewable.” The Ninth Circuit rejected that proposition as “contrary to the fundamental structure of our constitutional democracy.” In the second travel-ban case, the government has modified its position slightly: It now argues that in assessing whether Trump’s travel ban violates the establishment clause by targeting Muslims, the courts should ignore all the evidence from Trump’s own mouth that this was in fact its purpose and defer to his action, so long as the order itself doesn’t mention Islam. Like the earlier claim that the executive order was unreviewable, this latest appeal for blind deference would render the courts a rubber stamp.